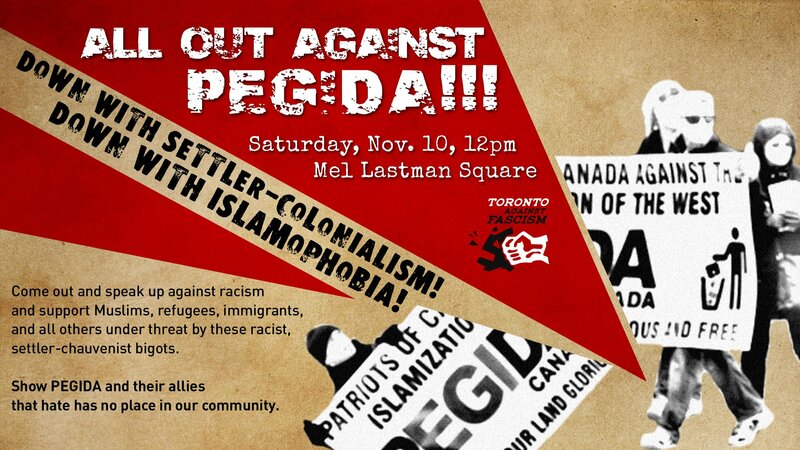 Call by Toronto Against Fascism (TAF) for counter protests against PEGIDA demo on November 10, 2018. Originally published by Toronto Against Fascism Facebook event page. Once again PEGIDA (the “Patriotische Europäer gegen die Islamisierung des Abendlandes”) is planning to hold an anti-Muslim, anti-refugee rally in Mel Lastman Square. Once again, we expect various far-right groups to take part, including the Proud Boys, the Northern Guard, the Three Percenter militia, and others. And once again, we intended to shut it down. TAF will be there to stand against racism and fascism. Please come out and support Muslims, refugees, immigrants, and all others under threat by these organizations. Previous post: Arna: STRIKE BACK! – Evaluation on tactics and strategy.